Eating avocados to lose belly fat sounds like an oxymoron. After all, dieters have been told to avoid this high-fat fruit for years. The avocado, however, is high in the good monounsaturated fats. Unlike saturated and trans fats, monounsaturated fats are not inflammatory, so they actually help to flatten belly fat, according to a 2010 segment on the "Dr. Oz" television show. Belly fat, also known as omentum fat, is much more harmful than the subcutaneous fat on your hips and thighs. That's why the medical professionals at Mayo Clinic and Real Age say you are better off with a pear or avocado body shape than with an apple body shape. The dangerous omentum fat in the stereotypical "beer belly" is feeding fat directly to your organs and arteries, raising bad LDL cholesterol and triglycerides. Too much belly fat increases your risk of heart disease, diabetes and cancer. Guacamole is the most popular way to dip into an avocado, but the salty chips and sour cream that go with it add more fat to your belly. 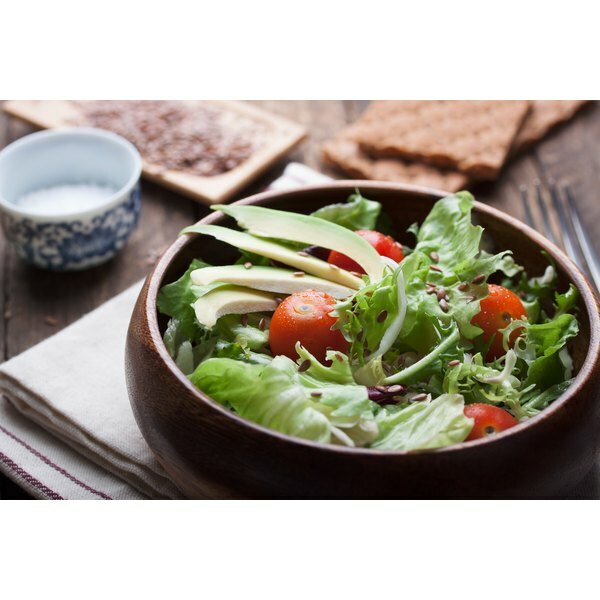 Try making avocado salad by dicing or slicing ripe avocados into your favorite bowl of greens. Avocados are versatile. They taste good tossed in with virtually every food you can think of--salmon, shrimp, chicken, crab, pasta, papayas, bacon, black beans, mangoes and more. Served warm or cold, with tangy citrus or zesty lime dressings, avocados add rich, creamy flavor and fat-busting flavonoids to any meal. Healthy monounsaturated fats are not the only thing avocados have going for them. An ounce of avocado gives you 60 percent more potassium than bananas. These fiber-filled fruits are also loaded with Vitamin B6, Vitamin C, Vitamin E, magnesium and folate. They are cholesterol and sodium free, too. If you are counting calories and concerned that an avocado salad sounds too rich for your diet, consider these facts. While the average avocado has about 200 calories per 125 grams, its high content of monounsaturated fats is known to curb cravings for foods that contain the unhealthy saturated fats. So avocados are actually a satisfying substitute for those high-fat, high-calorie foods you might be tempted to throw into your salad instead. According to the Avocado Grower's Association, the California Hass Avocado lets you know when it's ripe. Look for an oval-shaped fruit with pebbly skin that has turned from green to nearly black. It should feel heavy and slightly soft to the touch. Brenda Asheim is a freelance copywriter in the Seattle area. She has more than 25 years of experience writing ad copy for anything from Fortune 500 to small businesses in high-tech, health care and consumer industries. A second-degree black belt and certified taekwondo instructor, Asheim also writes the Seattle Fitness Examiner column.